Before starting any of the exercises mentioned below, search advice from your physical therapist, for he is the only one that really knows your actual condition and what you shouldn’t do or should do. In order to achieve proper rehabilitation of your injury it is important to ensure the exercises are performed with good technique, for poor practice leads to poor performance and potential strain on your injury. To avoid that, it is important the presence of a physical therapist. If at any time you feel pain or discomfort, stop the exercises and consult your physical therapist. 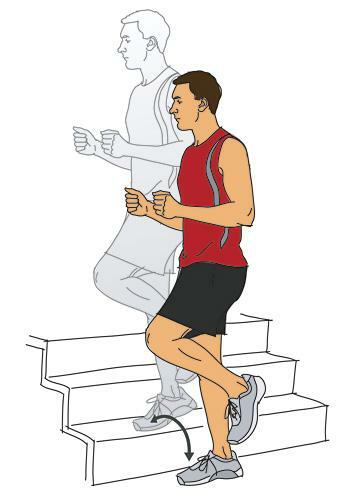 When injured it is particularly important that you warm up with a fast walk (at a pain free pace) for 3-4 minutes before you start your exercises. This increases your circulation and helps prepare your muscles. 1. Sit with your affected leg straight and supported on the floor or a firm bed. Place a small, rolled-up towel under your affected knee. Your other leg should be bent, with that foot on the floor. 2. Tighten the thigh muscles of your affected leg by pressing the back of your knee down into a towel. Hold for about 6 seconds, and then rest for up to 10 seconds. 3. Repeat 8 to 12 times. 1. Lie on your back with your good knee bent so that your foot rests flat on the floor. Your affected leg should be straight. Make sure that your low back has a normal curve. You should be able to slip your hand in between the floor and your back, with your palm touching the floor and the back of your hand touching your back. 2. Tighten the thigh muscles in your affected leg by pressing the back of your knee flat down to the floor. Hold your knee straight. 3. Keeping the thigh muscles thigh and your leg straight, lift your affected leg up so that your heel is about 12 inches off the floor. 4. Hold for about 6 seconds, and then lower your leg slowly. 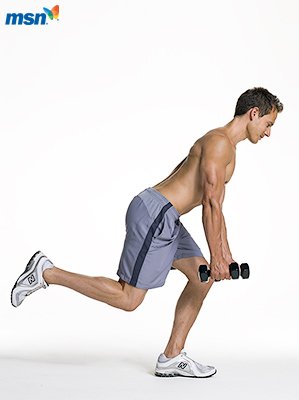 Rest for up to 10 seconds between repetitions. 5. Repeat 8 to 12 times. 1. Stand with your back against a wall and with your feet about shoulder-width apart. Your feet should be about 12 inches away from the wall. 2. Put a ball about the size of a soccer ball between your knees. Then slowly slide down the wall until your knees are bent about 20 to 30 degrees. 3. Tighten your thigh muscles by squeezing the ball between your knees. Hold that position for about 10 seconds, and then stop squeezing. Rest for up to 10 seconds between repetitions. 4. Repeat 8 to 12 times. 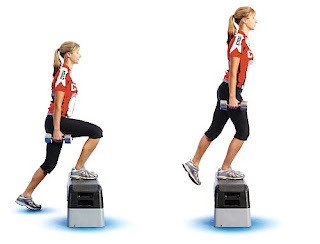 After being able to perform well the exercises mentioned above (not only being able to do the exercise, but to do it correctly, with appropriate control), there is an exercise program to stretch thigh muscles, strengthen the quadriceps and correct lower limb alignment in order to improve the tracking of your patella. 1. Stand facing a wall with your hands on the wall at about eye level. Put your affected leg about a step behind your other leg. 2. 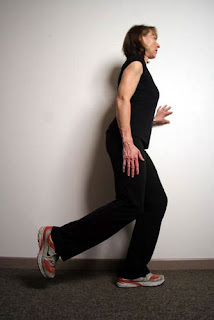 Keeping your back leg straight and your back heel on the floor bend your front knee and gently bring your hip and chest toward the wall until you feel a stretch in the calf of your back leg. 3. Hold the stretch for at least 15 to 30 seconds. 4. Repeat 2 to 4 times. 5. 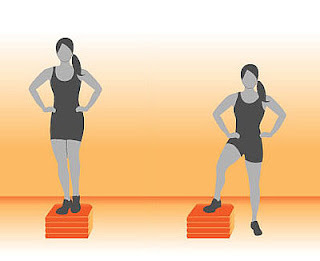 Repeat steps 1 through 4, but this time keep your back knee bent. 1. If you are not steady on your feet, hold on to a chair, counter, or wall. 2. 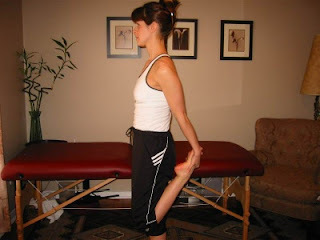 Bend your affected leg, and reach behind you to grab the front of your foot or ankle with the hand on the same side. For example, if you are stretching your right leg, use your right hand. 3. Keeping your knees next to each other, pull your foot toward your buttocks until you feel a gentle stretch across the front of your hip and down the front of your thigh. Your knee should be pointed directly to the ground, and not out to the side. 4. Hold the stretch for at least 15 to 30 seconds. 5. Repeat 2 to 4 times. 1. Lie on your back in a doorway, with your good leg through the open door. 2. 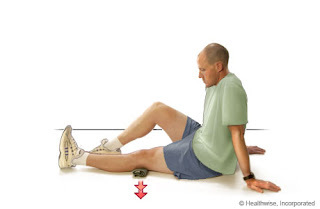 Slide your affected leg up the wall to straighten your knee. You should feel a gentle stretch down the back of your leg. a. Do not arch your back. b. Do not bend the knee. c. Keep one heel touching the floor and the other heel touching the wall. Do not point your toes. 3. Hold the stretch for at least 1 minute. Then over time, try to lengthen the time you hold the stretch to as long as 6 minutes. 1. 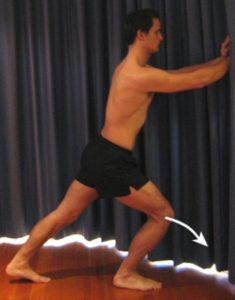 Stand side on to a wall with the affected leg closest to the wall. 2. Place your arm on the wall for support and cross the affected leg behind the other. 3. Lean your hips towards the wall. Keep your spine and pelvis in a neutral position. 4. Hold the stretch for at least 1 minute. Apart from the physical therapy, these exercise daily could be helpful. Good job. Great post! Let me share you something about the benefits of physical therapy education which include the intrinsic rewards of life as a PTA. In other words, you are helping people each and every day of your career, and having a direct role in. Visit good website for the details.